Earlier this year, Triangle Day Care Malvern was selected as a charity to benefit from Waitrose Great Malvern’s Community Matters token scheme. Last week, Triangle Day Care Malvern’s manager Shirley Bradley and one their clients attended a special celebratory afternoon tea and cheque presentation at the store. 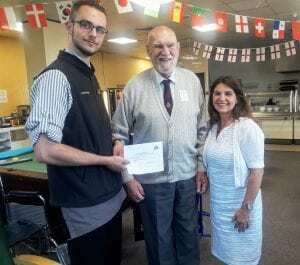 Joe White, Waitrose Great Malvern’s Community Matters Branch Champion presented them with a cheque for £500 towards the service. Find out more about Triangle Day Care Malvern.